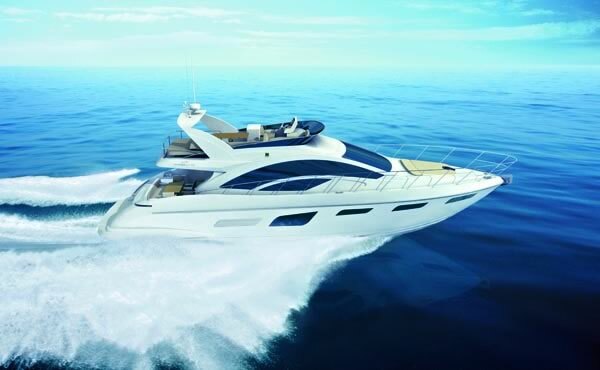 Intermarine, a Brazilian shipyard leader in luxury yachts , has presented its new Intermarine 60. Following the style adopted for the new Intermarine range, it brings innovations not only in design but also in the interior and is one of the few yachts in this category featuring three suites. The new model will be sailing in the first semester of 2011. With 60 feet in total length, the New Intermarine 60 is a yacht created to enjoy the sea with a lot of sophistication and comfort. Designed by Intermarine, with collaboration of the studio Fernando de Almeida Yacht Design which signs the interior of the yacht, it has lines that combine elegance and boldness, and the large saloon windows, by its dynamic format, bring the sensation of movement. The windows of the broadside, as well as the New Intermarine 55, have an innovating trapezoid format and all the portholes are inserted inside of these glazed structures. Apart from introducing much more light and beauty to the inside area, these new windows present a new design trend. The interior of the yacht brings as a distinguishing feature the refinement and the excellent use of spaces with furniture of straight lines. 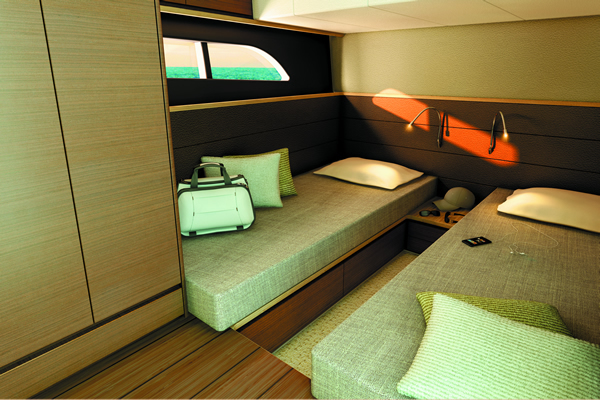 The New Intermarine 60 has three wide and comfortable suites, the main one located amidships, plus the crew cabin. 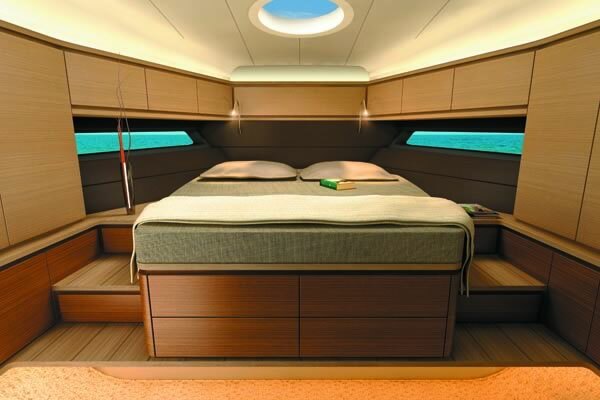 It accommodates six people and two crew members perfectly. 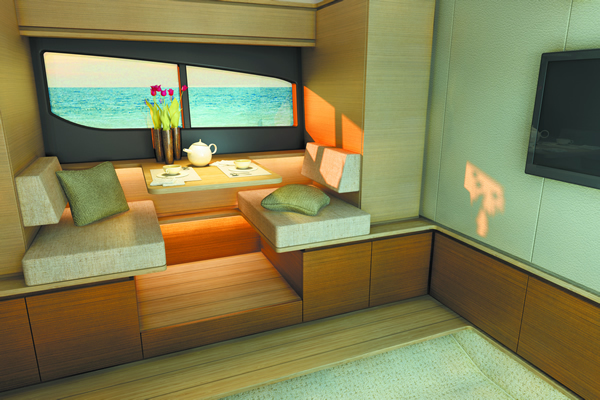 The luxurious yacht also satisfies those who appreciate the art of gastronomy, with a galley integrated to the lounge area and a gourmet area in the cockpit. The design of the New Intermarine 60 unites the beauty of organic forms found in larger models of Intermarine’s new range to the boldness of the innovating windows of the broadside, resulting in an impressive and attractive yacht. The flybridge arch brings even more personality to the model. The large swim platform is equipped with hydraulic lift and allows hoisting easily a tender or jet ski, apart from being a leisure area by the water. The cockpit is ideal for use during hot climate and offers plenty of space and comfort to its occupants. It has sofa, dining table, cooler, storage compartments and a functional and elegant gourmet area, in which are located the sink, the grill and space for food preparation. The bow is quite spacious and comfortable, with large solarium. The flybridge has an innovative arrangement, with excellent use of spaces. 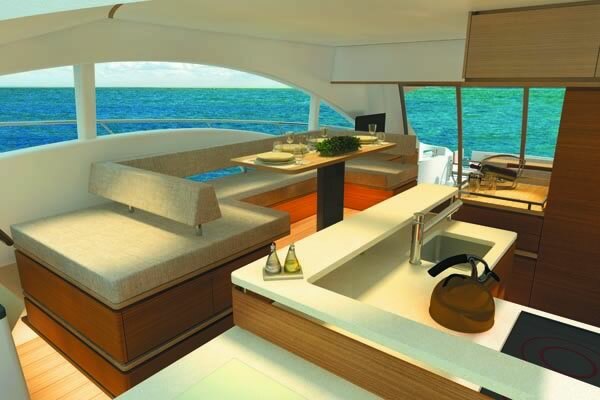 It has a helm station with seats for two people, solarium, a large sofa with dining table, plus a solarium in the rear at the same level of the sofa, and furniture with sink, refrigerator and space for a grill. 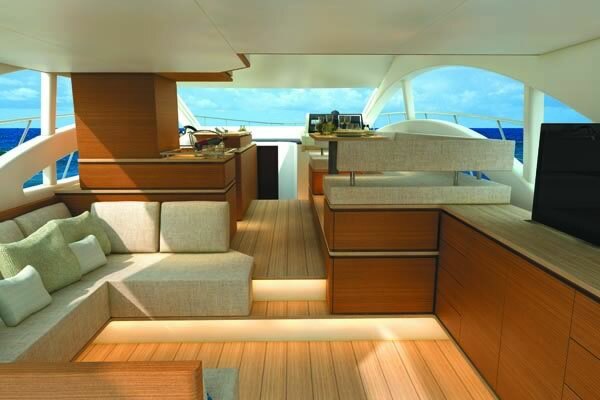 On the main deck, the saloon is divided into living room, galley, diningroom and helm station. The living area has two spacious sofas, the largest in U format, to port. The galley, also to port, integrated into the saloon, is complete. To starboard,the helm station is in front of the dining table. 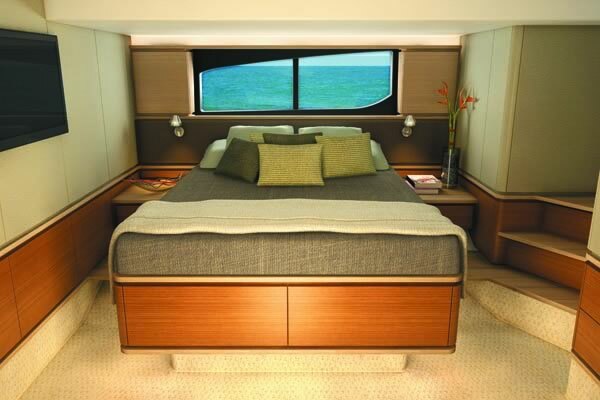 In the lower deck, the master suite occupies the entire width of the yacht and besides the bathroom with closed box, there is a queen-size bed and dinette. Large windows with sea views complement the environment with natural light and beauty. The VIP suite in the bow also offers a lot of comfort to a couple, with queen-size bed, large windows and bathroom. The guest suite, located on the starboard side, has two twin beds that be converted to a double bed, through a sliding mechanism. It also has bathroom and large windows with view to the sea. Other unique features of New Intermarine 60 are the three bathrooms of the yacht. Spacious and carefully planned, all have separate shower box, which makes them even more practical and functional. The crew cabin accommodates two crew members and has a private bathroom. 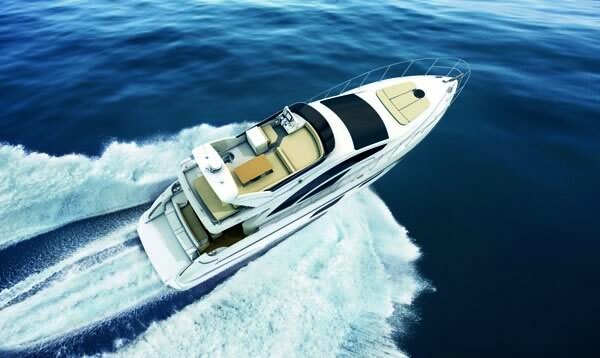 The excellent performance of New Intermarine 60 is guaranteed by two engines of 900 hp each. 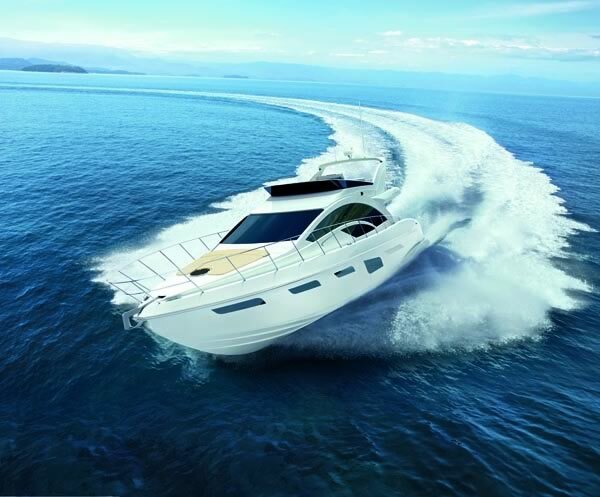 The maximum speed is 33 knots and the cruise speed is 28 knots all in all a full complete package for this superb 60 foot sports cruiser. Great to see sports cruisers of this calibre coming out of South America, good competition for all the other markets, will be interesting to see if the new range does well outside of the US markets too.